Poetry, letters and movies are a few of my favorite things so my heart was lifted when the three came together this weekend in one fabulous, forgotten film: Il Postino. 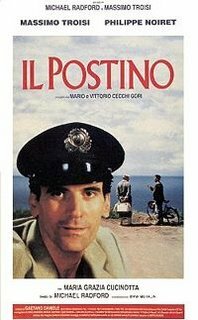 Set on a remote Italian island, Il Postino is the fictional story of a tender-hearted mailman whose life is transformed by Chilean poet Pablo Neruda, who offers lessons on love, life and poetry. I’d seen the movie before — in 1996 when it was first released and hailed by audiences and critics alike — but I had forgotten the details of the quiet tale. So, it was a wonderful surprise to enjoy the film again a dozen years later, and from a fresh, poetry-loving perspective. I won’t give away the details. It’s too much of a gem to let the magic loose. Just find it, watch it, and see your own ordinary life anew. the overpowering night, the universe. I wheeled with the stars. My heart broke loose with the wind.